Fumerie Parfumerie is committed to helping you find the perfect scent. To that end, we offer samples of nearly all of our fragrances (pending availability). Our samples are decanted by hand at our boutique in Portland into 1 ml colorless glass vials, measuring approximately 1.5" H × .25" W × .25" D. The samples are sealed with tight-fitting plastic caps with built-in applicator wands. As a brief aside, we have found the applicator wands to be completely useless and we recommend against using them to apply your fragrance. Please see the Application section below for more detailed information on this topic. Custom labels with the fragrance's name, house and concentration are affixed to each sample. Complimentary samples are included with every purchase of $50.00 or more (excluding sample orders). However, as long as your order has at least one eligible item (including books, magazines and bath and body products) and the order subtotal is $50.00 or more, your order is eligible to receive samples. The quantity of free samples depends on the total order value (excluding shipping). Once you have your order subtotal, you can consult the table below to find out how many complimentary samples are included with your order. We cannot guarantee that you will receive every sample that you request; however, we will do our best. Please note that substitutions may occur, depending on availability of certain items and we may or may not contact you in advance to let you know. If you request complimentary samples for an order that is not eligible for samples, we will ignore the request. If you request more complimentary samples than you are entitled to, we will choose a random assortment of the fragrances you requested. If you would like to include substitutions in case something is out of stock, please note this in your requests. You can purchase as many samples as you like, provided the item is available. To purchase samples, simply visit a fragrance page and select the 1 ml option from the dropdown menu. We offer annual sample subscriptions. Subscriptions may neither be cancelled early for a pro-rated refund nor transferred to another individual. To sign up for an annual sample subscription, visit the item page here. We have been told that our samples are difficult to open. In our experience, with the correct technique, the lids pop right off. Below, I have included an artistic rendering of the correct technique. 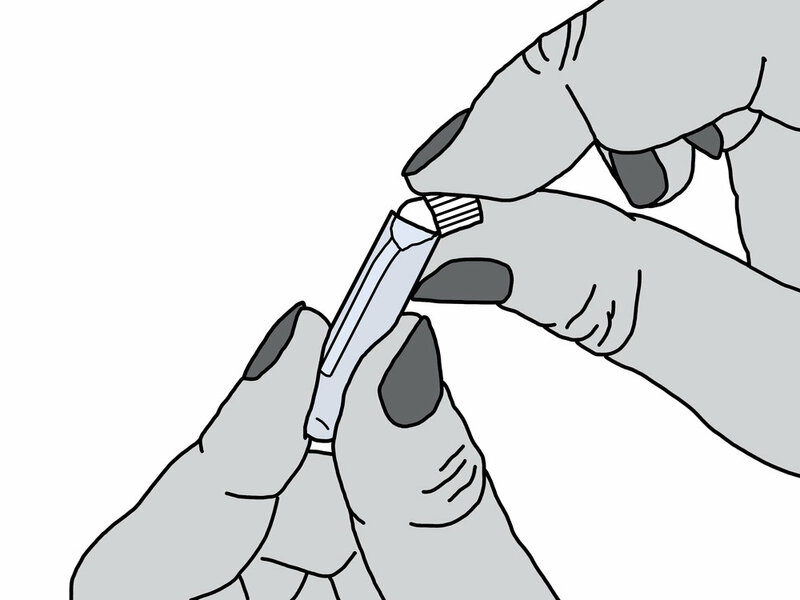 Place the glass vial between your left thumb and index finger and the plastic cap between your right thumb and index finger. Holding tightly, motion like you are snapping a match stick in two. The plastic cap will pop right off. Make sure that the vial is held upright so the fragrance doesn't spill. As I mentioned before, the wands are utterly useless. In terms of application, I prefer to use the Dab'n'Flip method. I have been using this method for years and I have yet to discover a more user-friendly alternative. To execute this move, hold your uncapped vial in front of you in your dominant hand. If you are right-handed, you would hold the vial upright in your right hand and then extend your left arm and position your inner wrist on top of the vial, making sure that you have a tight seal. Then, in one smooth motion, fully supinate your wrist while holding the vial in place with your dominant hand. The vial should now be positioned above your inner wrist with the opening held tightly against your skin. At this point you can carefully move the vial about while making sure to maintain enough of a seal to prevent the fragrance from spilling out or you can simply pronate your wrist, reposition the vial and repeat the process. Either way, this is a fast, convenient and effective way to apply fragrance from a sample vial. We chose our sample vials because they seal tightly and they are far less liable to leak than any spray sample that we have tried (this includes evaporating). Our primary concern was long-term storage. The majority of people do not go through their samples quickly so we wanted to provide a vessel that could contain the fragrance for long periods of time. I can't tell you how many of my spray samples have just evaporated away, leaving a thick, gooey resin at the bottom of a bottle. This is not to say that spray samples do not have their applications. I use them when I travel and I plan to use a given sample in a relatively short period of time. However, based on the feedback that we have received, a majority of our customers hold onto their samples for years and sample vials are the obvious choice for long-term storage. If you do not like the sample vials we use, please feel free to purchase your own sample bottles and decant our samples into your bottles after you get home. That being said, we will not fill your bottles at Fumerie. We offer special, reduced-cost shipping for orders that contain nothing but samples. If you're ordering from the United States, just select the USPS First Class Mail (Samples Only) shipping option from the dropdown menu at checkout. We also have a reduced-cost sample shipping options available for our international customers; just select either the USPS First Class International (Samples Only) option of the USPS First Class International (Samples Over $80.00) option, depending on the order subtotal is USD. Before placing your order, please visit our Policies & Shipping Info page to verify that we ship to your country. If your country is not on the list, email us at info@fumerie.com. Domestic sample orders over $100 shipping to the contiguous United States are eligible for free shipping. To take advantage of free shipping, simply select the Free USPS Ground (Enter Promo Code FREESHIP) option and, as the shipping option instructs, enter the promo code FREESHIP into the discounts box during checkout. Please note that if you add anything other than samples to your sample order, your order will not be eligible for reduced-cost sample shipping. Failure to choose an appropriate shipping method will result in delays. Your order will not ship until an appropriate shipping method is selected and any outstanding balances for shipping adjustments are paid.